UNITED NATIONS, December 1 -- Two days after denying that UN officials keep for themselves the frequent flyer miles associated with official travel paid by the UN, UN acting Deputy Spokesman Farhan Haq both denied having said it and refused to provide even an estimate of the frequent flying miles racked up and kept in 2010 by Secretary General Ban Ki-moon and his Under Secretaries Alain Le Roy and Lynn Pascoe. Video here, from Minute 8:12. On November 29, Haq had told Inner City Press that frequent flyer miles are the "possession of the United Nations... held by the United Nations." On November 30 he said that the UN Ethics Office says it is fine that they are not. 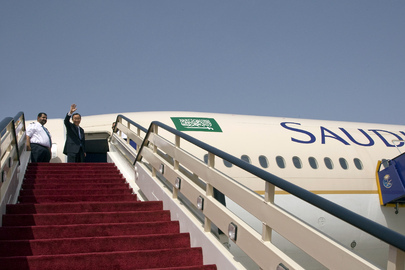 The refusal to disclose Ban's frequent flyer miles is in contrast to Haq's office's previous boasting about how many miles Ban has flown in his term as Secetary General. How many of these miles were on commercial carriers and how many of the frequent flyer miles has Ban so far kept? We will continue to pursue this basic financial information, from and about a Secretary General who has bragged by transparency. 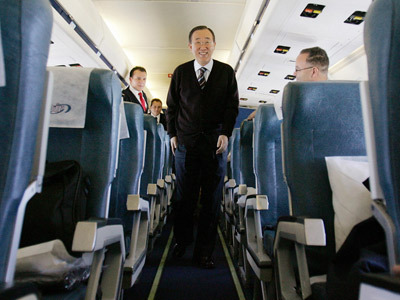 Inner City Press asked Haq for the Secretary General's Office's response to a UN Joint Inspection Unit recommendation that the Secretariat (and other UN agencies) ask officials to apply “their” frequently flyer miles to future official travel, as done at the UN Office of Project Services. Rather than explain why the Secretariat has never acted on this recommendation by the UN system's Joint Inspection Unit -- a recommendation apparently not mentioned by the UN Ethics Office which at the eleventh hour was called in to rubber stamp the personal taking of frequent flyer miles associated with UN paid travel (and also the taking of UN staff member time to work on Under Secretary General Francis Deng's book) -- Haq twice insisted that Inner City Press should contact UNOPS' spokesperson Nicolas George. But the question is not about UNOPS, it's about the Secretariat's (and Secretary General's) allocation of frequent flyer miles associated with UN paid travel. Watch this site.